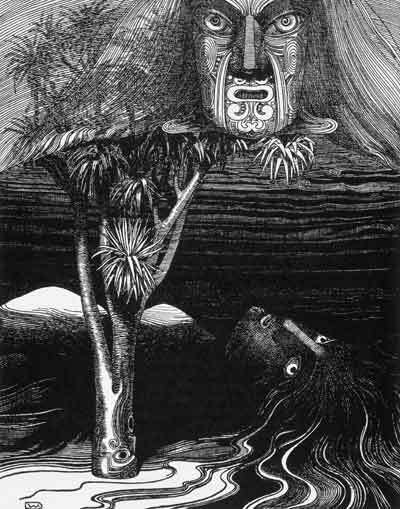 'Rangi (sky father) and Papatūānuku (earth mother)', by Wilhelm Dittmer (1907). ‘There’s lots of Gods; well there’s two Gods – there’s the God who is everywhere, and then there’s Papatūānuku. God looks after everything, but Papatūānuku looks after the garden, and even the basil in the glasshouse’. ‘Yeah, of course. They are best friends. They listen to each other, and care about each other. They tell each other stuff, everything there is to tell, and then they all go to bed in the same room, like me and Samuel do’. ‘God’s got lots of legs – 166,000 legs. God’s got legs everywhere. But only two hands – the Holy Spirit and Jesus are like God’s hands. God doesn’t need any more hands. Two is enough. But God needs lots of legs. Otherwise God couldn’t go to Australia’. ‘And do God’s legs look like our legs, or are they different’. ‘Don’t be silly daddy. God’s legs are square, and they are all different colours too’. ‘Yes. They are round. And they are colourful too. And Papatūānuku has hair, even when she’s in the sea, and in the garden, and in the glasshouse’. How delightful! Have you read Robert Coles’ book ‘The Spiritual Life of Children’? It had a big impact on me when I was training to be a primary school teacher. I am glad God has lots of legs (mine don’t work so well at the moment) and I love that Jesus and the Holy Spirit are His hands :) What a magnificent conversation! Karl Rahner, ‘Ideas for a Theology of Childhood’, Pages 33–50 in Theological Investigations, Volume 8: Further Theology of the Spiritual Life 2. London/New York: Darton, Longman & Todd/Herder and Herder, 1971. T. Wyatt Watkins, ‘Unfettered Wonder: Rediscovering Prayer Through the Inspired Voices of Children’, Pages 131–45 in Nurturing Children’s Spirituality: Christian Perspectives and Best Practices. Edited by Holly Catterton Allen. Eugene: Cascade Books, 2008. Your daughter: a delightful chip off the old block. @ Mary and Pam. Yes it was, and yes she is. I am not sure when she has been reading Irenaeus either, but I am pleased she has imbibed some of the Bishop of Lugdunum’s best insights.